Editor’s note: Lui, who’s now a regular game commentator for the E-Journal, wrote this after attending the second Pair Go World Cup in July 2016 and recently shared it with us. 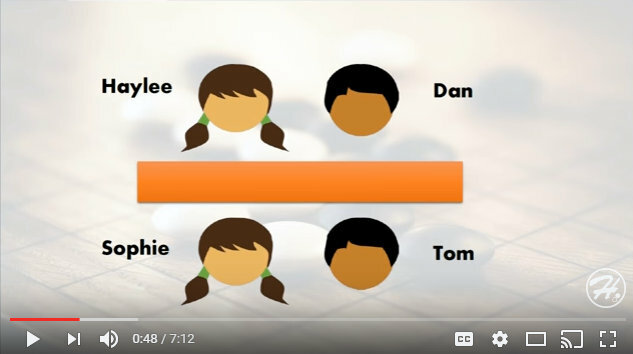 Coincidentally, Hajin Lee recently made a short Pair Go introduction video, saying she hopes “to see more pair go events in the US and Europe in the future.” We hope you enjoy both. 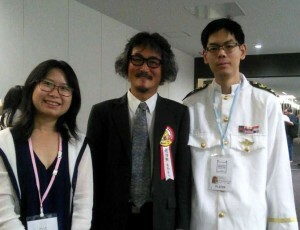 Reflecting upon his legendary career, the great Sakata Eio opined that a necessary prerequisite for go mastery is self- reliance, which can only be developed once one fully accepts the game’s solitary nature, specifically the completely isolated state that all players find themselves in during the process of a game. As far as I can tell, there are two types of people in this world: Pair Go enthusiasts and those who can do without. Takemiya Masaki gushes that Pair Go is “playing catch with the emotions…the instant that love is born.” Ishida Yoshio, on the other hand, says that in Pair Go you have three opponents. The most anticipated match in the first round of the main knockout tournament saw the departure of powerhouse Chinese pair Shi Yue and Wang Chenxing, who succumbed to the charming synergy of Choi Cheolhan and Oh Yujin. Our first-round victory against the Thai pair was defined more by relief than pleasure, since it ensured that we would get to play at least one more game. In the second round against Taiwanese superstars Chen Shiyuan and Joanne Missingham, the game became difficult right from the start when a mistake in judgment set the tone for the rest of the way. My partner Sarah Yu fought gamely during many continuous kos and we maintained our chances for a while but were unable to cause an upset. Our conquerors would go on to score an excellent victory in the semifinal against the Choi-Oh pair, earning themselves a final showdown with the Chinese pair of Ke Jie and Yu Zhiying, the male and female world No. 1 respectively. During the last round of the Shuffle Pair Go friendship match, I was paired with the Thai female player, Pattraporn Aroonphaichitra. As we waited at the board for our opponents, Amy Song, the Australian female player took the seat across from Pattraporn. But who was her partner? I took a quick glance around – there were still a few empty seats and just a couple minutes until game time. I couldn’t help but smile when I noticed Sarah, looking ever so serene, sitting next to Iyama Yuta. My new partner was completely absorbed in her phone, and I opened my mouth to say something when, sensing a disturbance in the Force, we both looked up. Making his way through the large crowd that had gathered around the closed-off playing area with ruthless efficiency was “One Dragon Per Game” Shi Yue, one of the strongest and most universally feared Chinese pros for his aggressive playing style. Pattraporn played beautifully and we enjoyed a lead for most of the game. It was a singular experience to watch as Shi Yue struggled to contain his frustration with the position as his plans to deal us pain were disrupted again and again. When the game was over, Shi Yue transitioned seamlessly from executioner to teacher, pointing out missed opportunities and explaining his thought processes at key points while the rest of us sat transfixed by the clarity of his analysis. A while later, only dimly aware that the postmortem had concluded and that the others had started putting the stones away, I slowly and reluctantly joined in. Later that night, long after Yu Zhiying and Ke Jie had collected their 10 million yen 1st place prize, I would find myself tuning in to the Wimbledon final from my hotel room. During one of Andy Murray’s signature tirades, I realized that Ishida was wrong. Whether you are playing Pair Go, individual go, or tennis, the number of opponents remains the same. One, and it’s not the one on the other side. As Murray sealed the first set with a thunderous forehand and an emphatic fist pump, his fierce visage betraying equal parts triumph and anguish, I was reminded of a timeless image of Sakata, in the midst of his prime, staring at the go board with an expression of utmost intensity and exquisite pain. A formidable, yet lone individual. 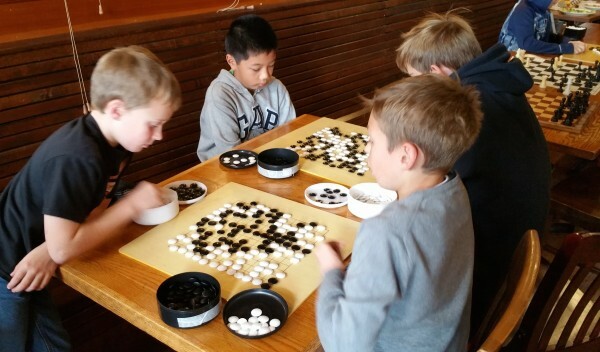 Pair Go was invented to popularize the game of go by emphasizing the social aspects of the game. But no matter how many players there are, the game itself remains the same mysterious, fascinating challenge it has been for thousands of years. The Confucius Institute of Rutgers University, together with the Feng Yun Go School, will be hosting a go tournament on Saturday, April 1 at the College Avenue Student Center in New Brunswick, NJ, reports Paul Matthews. Click here for more details. Feng Yun 9P will do game reviews between rounds. There are no registration fees, but you must register online no later than Thursday, March 30 to guarantee your seat. 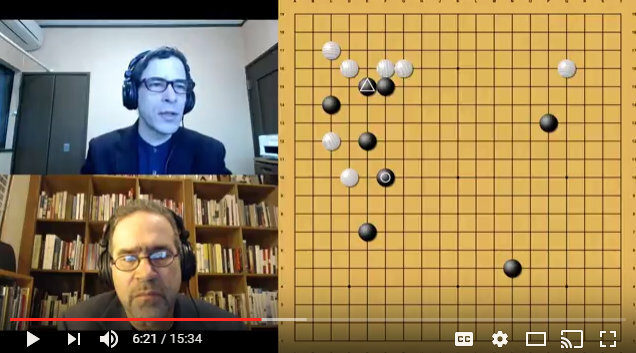 This game commentary file accompanies Redmond’s Reviews, Episode 1: Artem Kachanovskyi 1p v. Alexandr Dinerstein 3p, the first in a brand-new series of AGA video commentaries with Michael Redmond 9P and Chris Garlock, Managing Editor of the American Go E-Journal. 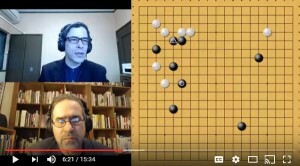 In March 2016 the two teamed up to provide live commentary on the historic 5-game match between Lee Sedol 9P and AlphaGo — available on the AGA’s YouTube Channel – and now plan to do go video commentaries on a regular basis. Each video commentary — produced by Michael Wanek — will be accompanied by sgf commentaries that will include comments and variations by Redmond, enabling the video commentary to focus on the major points in a shorter format. We hope that you enjoy this new series and look forward to hearing your feedback; email journal@usgo.org with your comments or questions. The AGA is also currently working on producing video commentaries by other professionals on Master games; stay tuned for updates on those soon. 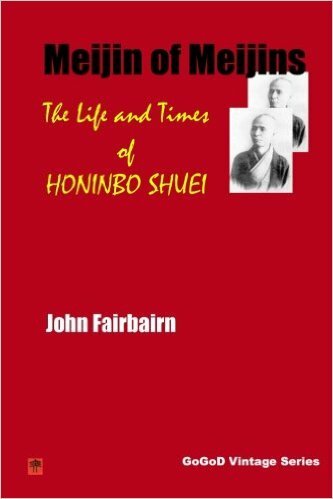 Go translator and historian John Fairbairn draws upon his phenomenal knowledge of go history and his collection of classic works to craft “Meijin of Meijins: The Life and Times of Honinbo Shuei,” an entertaining and educational book covering the life of one of the strongest members of the Honinbo “family,” Honinbo Shuei. Shuei has long been the most admired and emulated player amongst go professionals in Japan. 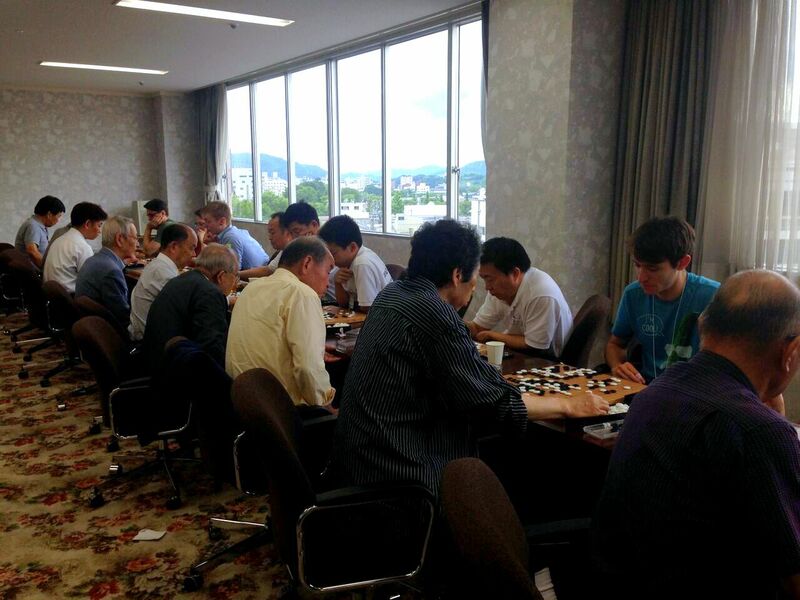 He gave Honinbo Shusai black in every game they played, and won a solid majority of them. It is a marvel that he became so strong, because during his lifetime, the go world in Japan was thrown into turmoil with the abolishment of government support by the new Meiji apparatus. How the Honinbos and other go families coped with their reversal of fortunes makes for a good read. With a grand total of just three diagrams in the book, this is not the book for those interested in reviewing Shuei’s games. But if you want a taste of the inside workings of the go community during the late 1800s up to 1908, this is an absolute jewel. There are some organizational problems with the narrative, with some repetition of events – perhaps because the book is pulled from a larger e-book (which does contain commented games) with “light editing.” But overall, the writing is excellent and for fans of go history, I highly recommend this book. It’s published using Amazon’s instant-printing process, which offers quality comparable to mainstream paperback go books with an amazingly low price ($9.99). “I taught two classes at Whitsitt Elementary school on Power Monday,’ reports Shawn Ray from Tennessee. “Power Monday is an event held once a month to teach kids new subjects or ideas. At the end of both classes, the kids were begging me to come back on the next Power Monday. This is my second time at Whitsitt and both times have gone very well. The picture is of kids playing 2v2 capture go. I only had one hour to teach so I decided to start with capture go and put them in teams (they really enjoy working in teams). I must thank everyone who supports the American Go Foundation! 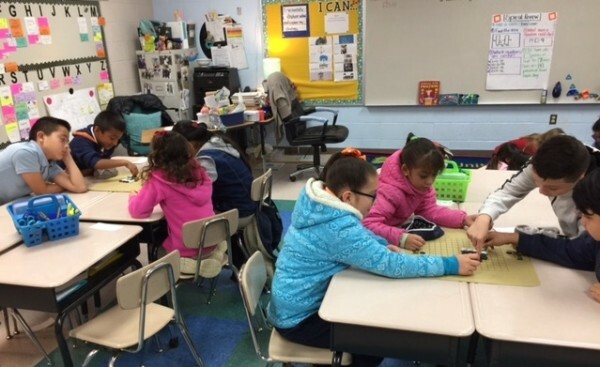 Without the AGF’s grants and equipment, I would not be able to teach in after school programs as much as I do,” adds Ray. - Paul Barchilon, EJ Youth Editor. Photo by Shawn Ray. The AGA has received a request to send a young US or Canadian player to Tokyo, Japan for the 4th GLOBIS Cup U-20 World Go Championship, to be held April 20-23, 2017. The event, sponsored by the GLOBIS Corporation and organized by the Nihon Ki-in, will provide meals and accommodations for the players, as well as an accompanying adult if the player is under 18. Air fare will be borne by the player and companion. The player must be under 20 years old as of January 1, 2017, and meet the other AGA or CGA eligibility requirements. Any necessary online play-offs will take place between Feb. 21 and Feb. 27. This is a great opportunity to compete in an international tournament, explore Tokyo, and represent the AGA and CGA. Interested players should respond with their names, best form of contact, and KGS IDs before midnight Feb. 20 to president@usgo.org. The Ing Foundation is hosting the 2017 International Collegiate Go Tournament, to be held at Panyapiwat Institute of Management, Bangkok, Thailand, this summer. The event starts on July 7th and will finish on the 13th. This event is open to any current, future, or recently graduated college (both undergraduate and graduate) student, who will or has attended school in the year 2017. All costs related to room, board, tours, and travel during the event will be covered by the Ing foundation. The student is responsible for getting to and from the tournament site(both international and domestic travel costs), and for any personal expenses such as souvenirs, and entertainment during the course of the trip. Click here for complete details. The second Japan Go Congress will be held July 14th to July 17th in nearby Takarazuka City, so camp participants can participate in both, if they want. Register by the end of February and receive a 5,000-yen discount (only available for those who participate in the Osaka Go Camp for the full term). “I promise that everyone can improve quite a lot through the Camp and the Congress and will have a lot of fun!” adds Maeda.